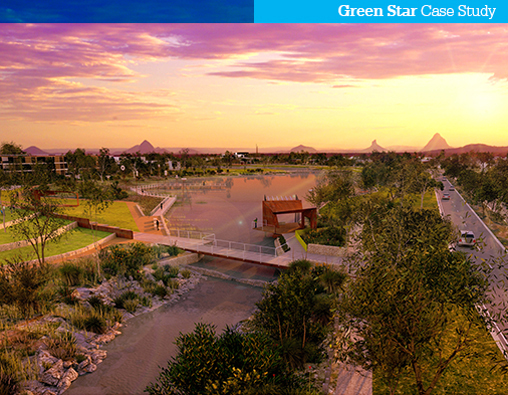 The Green Building Council of Australia has awarded the Caloundra South Master Plan with a 6 star green star rating for social and economic sustainability and environmental performance. The master plan illustrates an environmentally positive outcome for the site that is almost entirely cleared of vegetation from past uses with approximatly 1/3 (700ha) of the site being revegetated and dedicated for conservation purporses. The Caloundra South Master Plan demonstrates that it is possible to undertake a development of unprecedented scale and achieve world class environmental and social outcomes. 'Sustainable communities respect, protect and restore the environmental systems that support them. They are resource-efficient and tread lightly on the planet. At Caloundra South, more than 700 hectares, nearly one-third of the site, will be rehabilitated from decades of use as a former pine plantation and designated as a conservation area.